OWINGS MILLS, Md. (AP) — Baltimore safety Eric Weddle proudly proclaimed this wasn’t the same Ravens team following a spirited victory over the Broncos in Week 3. The Ravens (3-2) have dropped out of first place in the AFC North following their 12-9 overtime loss to the revamped Cleveland Browns on Sunday. The performance was reminiscent of Baltimore’s struggles in 2017 when it failed to make the postseason for the third consecutive year. The Ravens couldn’t muster a touchdown and committed two turnovers, including one in the red zone, against a Cleveland defense that is ranked in the bottom third of league. Baltimore gave up 342 yards passing and a touchdown to rookie quarterback Baker Mayfield. The secondary also allowed a long play downfield in overtime that set up the game-winning, 37-yard field goal by Greg Joseph with two seconds remaining. Coach John Harbaugh defended his team’s ratio between passing attempts (57) and the number of times the Ravens ran the ball (25) at his Monday news conference. Ravens quarterback Joe Flacco was 29 of 56 for 298 yards and an interception on the Browns 2-yard line with his team leading 3-0. He was also sacked twice. Baltimore had broken an NFL record earlier this season with 12 touchdowns on its first 12 trips inside the red zone. 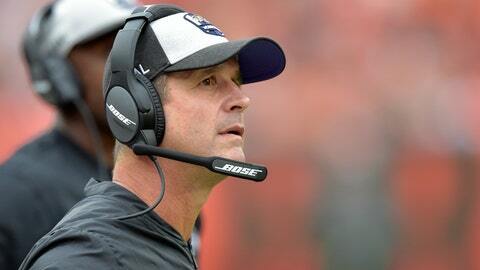 However, the Ravens have since cooled down and were held scoreless in three red-zone opportunities against Cleveland. Entering the year, Flacco was provided with more talent at wide receiver with the free-agent signings of Michael Crabtree, John Brown and Willie Snead. That trio has made plays throughout the season. Crabtree led the team with six catches for 66 yards against Cleveland. Brown had four catches for 58 yards and Snead caught five passes for 55 yards. However, Crabtree had a couple of critical drops that would have extended drives. He also could not hang onto a potential game-winning touchdown in the final minute of regulation. After the game, Crabtree took responsibility for the loss. The Ravens have to quickly regroup and prepare for the Tennessee Titans, which will close out a string of three consecutive road games. Baltimore will face its former defensive coordinator Dean Pees, who retired after the 2017 season before accepting the same role in Tennessee.